We offers a complete line of cash receipts supplies and business forms for automotive dealers. 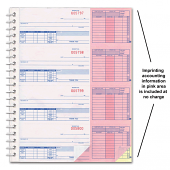 The cash receipts forms we offer, especially the receipts books, can also be used by motorcycle dealers, RV dealers, truck dealers and tire dealerships just to name a few. Guard your dealership's financial resources by using cash receipts forms to maintain stringent cash controls. With cash receipts, you can be sure that cash sales, credit sales, collections from loans, etc. are closely monitored, properly recorded and always reported. It's important that your customers receive a cash receipt as a written acknowledgment. All dealership employees who handle money as part of their job responsibilities should know how to use your dealership's a cash receipts system. All of our custom cash receipts forms are guaranteed to work with your dealer management system and auto dealer software. If you wish to order custom auto dealer forms, please call us at 1-866-348-6414 for a custom quote.